Last Tuesday, September 15, Women’s World Banking hosting The Clinton Foundation’s No Ceilings and UN Women’s Empower Women for a Twitter chat in honor of the 20th anniversary of the Beijing Declaration and Platform for Action. Entitled “#BuildOnBeijing,” the chat was intended to take a step back and celebrate the progress made on women’s financial inclusion since 1995, and also to look ahead and share ideas on where the gaps still exist and how to address them. The conversation kicked off with the basics. 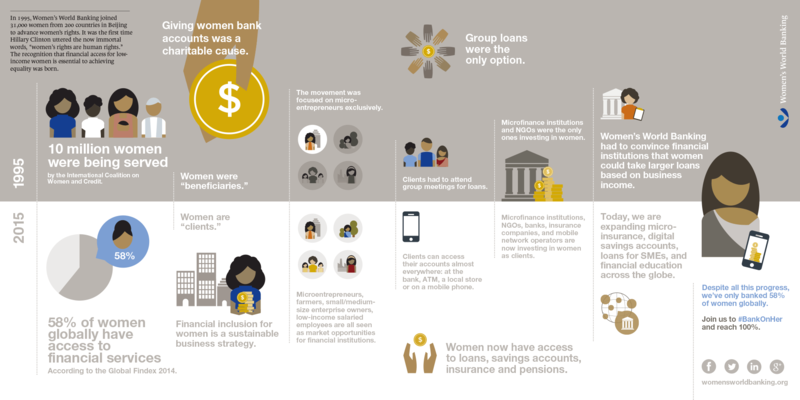 What is women’s financial inclusion? And why is it so important for women? Next we asked: Where have the biggest gains in women’s financial inclusion occurred? Taking a step back, which actions most helped spur this progress? Empower Women cited understanding of financing & knowledge gaps in serving women-led SMEs and strategic partnerships as critically important . No Ceilings pointed to a number of reasons: broader, deeper range of partnerships with business and the private sector; increased evidence for the moral and business case for women’s economic opportunity; the proliferation of access to technology, data and social media; and of course, the hard work of governments and nonprofits to promote women’s rights & full participation. We’ve identified the success areas. But’s it’s now time to take a hard look at the spaces where more work needs to be done., What areas need more attention from gov’t, NGOs and the private sector? Great – we know where our efforts should focus on. This then begs the question, what should we be doing to address these areas? As the section of UN Women dedicated to the economic empowerment of women, we asked Empower Women, what were their priority areas for advancing women’s economic empowerment & financial inclusion? And, how does savings promote women’s economic empowerment? Savings allows women to have more economic opportunities .They won’t have to make decisions based on financial dependency. And given No Ceilings’ 10,000 view from all the data at their fingertips, we asked them, What role does data have to play in ensuring that empowering women stays on track? And, who are unlikely allies or partners we can involve in advancing women’s equality? How? All play a role in advancing full participation of girls & women. Grassroots orgs & civil society are key, but… Tech, policymakers, men & boys, faith, biz & banks are also critical partners we must engage. So, looking back at where we’ve come to where we are now and looking ahead to where we want to be… What would the world look like if all women had financial access? We couldn’t agree more! Because for Women’s World Banking, if we #BankOnHer, economies would be stronger and women would be realizing their full potential. It is our hope that the imperative to #BuildOnBeijing lives on far beyond the 20th anniversary of the Declaration. There are a tremendous number of great ideas and initiatives (including campaigns such as Women’s World Banking’s #BankOnHer, No Ceilings’ #NotThere and Empower Women’s #IAmWoman) out there… ensuring that the right partnerships, tools, goals and commitments are in place to truly build on Beijing and achieve full financial inclusion for women.